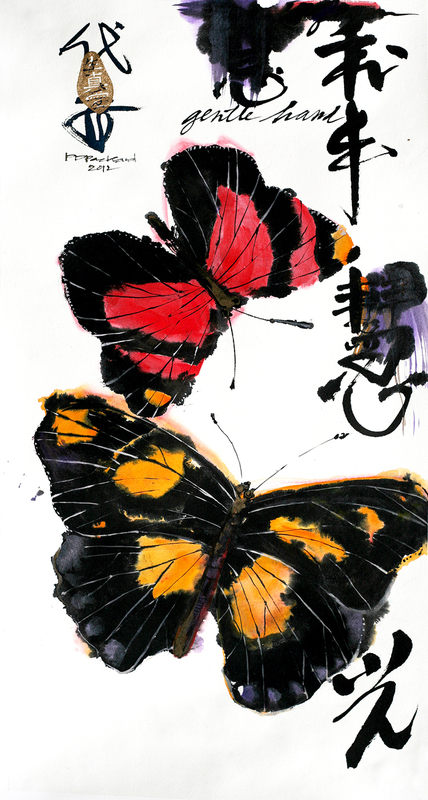 PD Packard’s vibrant sumi-e ink and watercolor insect paintings exhibiting at Mills Pond House Gallery in St James, New York, January 18 – February 20, 2014 and the Brooklyn Botanic Garden, February 8 – March 8, 2014. Same Mind, Packard's life-like watercolor exhibiting at Brooklyn Botanic Garden February 8 - March 8, 2014. PD Packard chooses to see beauty in the insect world that parallels our own. One may find something quite hideous about bugs but artist PD Packard chooses to see beauty in a world that parallels our own. 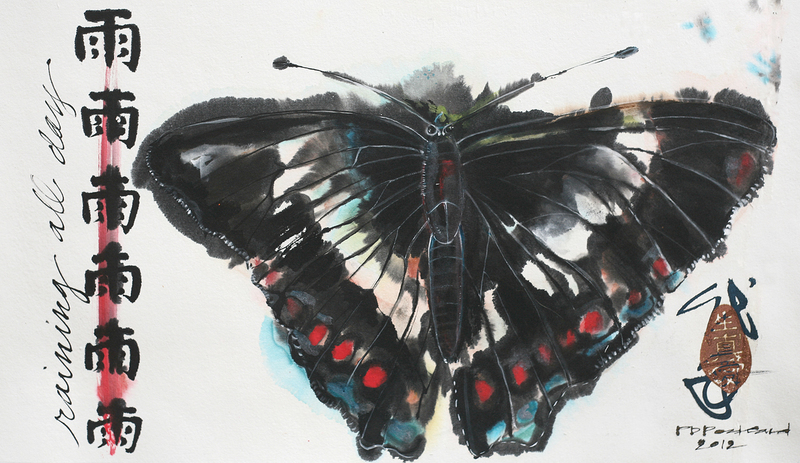 A selection of her insect paintings that pulsate with life will be exhibited at the Mills Pond House Gallery in St. James, New York, January 18 – February 20, 2014. Much of Packard’s inspiration comes from insects collected near her home at Prospect Park’s Long Meadow in Brooklyn, New York. With the casual study of entomology, Packard has seen and heard bats catching dragonflies mid-air, cicadas metamorphosing from the beetle’s hard shell to the insect itself, and male katydids loudly producing the sound “Katy did it” by rubbing their wings together. Packard claims that after these experiences in the park she will never again look at Long Meadow as just a pretty, green lawn. Since 2010, Packard has been exhibiting at the Mills Pond House Gallery, also know as the Smithtown Township Arts Council (STAC), in several juried and members’ shows. She has also had a solo exhibit through STAC's off-site outreach program at Apple Bank in Smithtown. Last year Packard was approached by Allison Cruz, executive director of STAC, to design an on-site Printmaking Workshop Studio at the gallery complex based on the donation of a large etching press. Still a work-in-progress, the STAC director’s goal is to develop a printmaking studio accessible to the local community and also offer classes specializing in various printmaking techniques. For Packard, it’s an opportunity to promote techniques of painting and drawing through the inspiring media of printmaking and even if slight, challenge the art market’s view of printmaking as a secondary status that is frequently segregated from other forms of art. Packard has a natural love for watercolor, but she never strays far from printmaking. For each insect painting Packard has created a custom designed mat made from the printmaking technique, blind embossing, where the paper is printed without ink and the image leaves an impression in the paper. Statements about unconditional love, a principle that she is committed to expressing in her work, can be seen subtly throughout the mats. 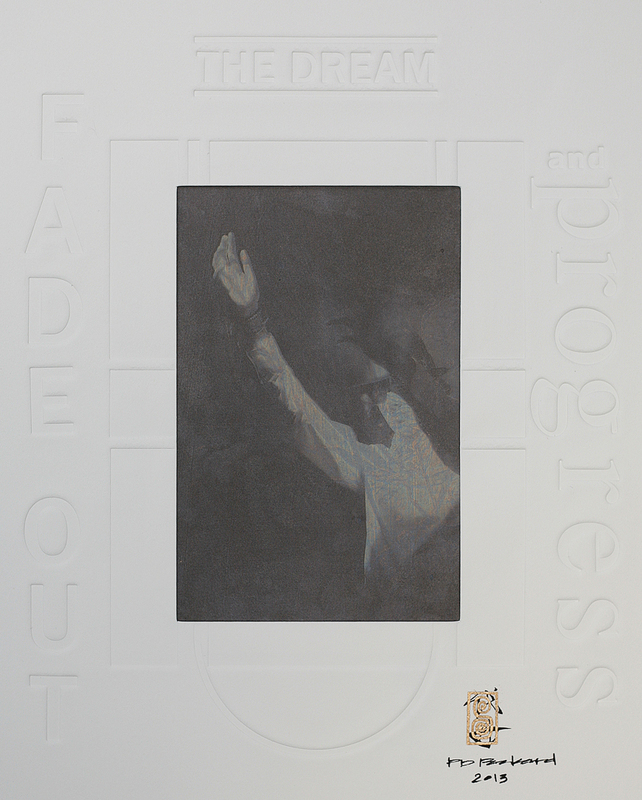 The Prophet’s Hat, Packard’s print created by the solarplate etching method, is included in the group show, 1/0ne, in the Manhattan Graphic Center’s Project Space. Curated by Eileen Zyko Wolter, the exhibit is based on new prints by thirty artist and runs from January 6 – 30, 2014. In addition, Same Mind, Packard’s life-like painting of a black widow spider, will be on view in the Brooklyn Botanic Garden’s annual exhibit, Vision in Nature, held in the Steinhardt Conservatory Gallery, February 8 – March 8, 2014. PD Packard's sumi-e ink & watercolor, Raining All Day, exhibiting at Mills Pond House Gallery. 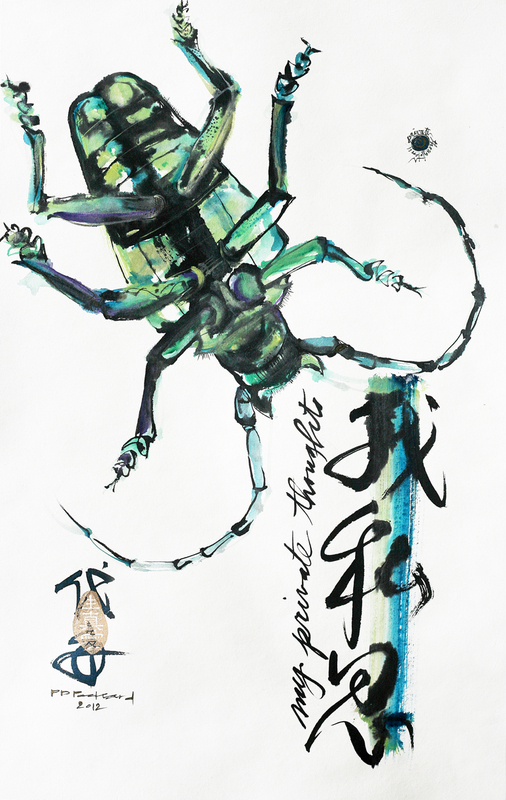 Packard's sumi-e & watercolor, All About Me Cicadas, exhibiting at Mills Pond House Gallery. Packard's sumi-e & watercolor, My Private Thoughts, exhibiting at Mills Pond House Gallery. Gentle Hand, Packard's watercolor on view at Mills Pond House Gallery. The Prophet's Hat, Packard's print currently on view at the Manhattan Graphic Center in NYC.